Philippe Camoin, having spent all his life on the Secret Codes of the Tarot, realized that the Tarot de Marseille, when fully understood, makes possible a revolutionary method of reading. Its originality is that it uses two rules invented by Philippe Camoin, called the "Law of the Solution Card" and the "Law of the Regard". The combination of the two laws in the method is unique and original. This method has the special feature of permitting one entity to write entire phrases which the querent and the tarot reader will be able to read. The cards are not interpreted simply in isolation, as is usually the case, but as taking part in an interactive whole, bringing to a reading a plethora of supplementary information which it would be absolutely impossible to get with other methods. Basically up until now, the cards were simply interpreted in isolation, one card at a time as archetypes. And this clearly limited the possible interpretations. In order to give accurate information, the reader needed either to be an accomplished medium or to have a great imagination. With the Philippe Camoin Method, it is all a world of codes and laws which opens up to the tarot reader as well as to the querent, who can follow how the tarot reader has been able to "divine" the problems of his past and how to resolve them in order to transform his future. 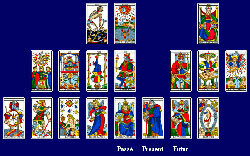 The tarot reader becomes a kind of "magician", who knows things, while the querent understands fully what is happening…. This method is protected by copyright.